Insects as food: What was unthinkable in Switzerland until recently is a reality today. With his start-up "Ensectable", veterinarian Dr. Benjamin Steiner is causing a stir in the meat market. For this organic pioneer, mealworms, crickets and co. are the most efficient, most sustainable alternative to animal protein. And he has the support of the Swiss Climate Foundation. The brains behind "Ensectable": Dr. Benjamin Steiner, Founder and CEO, at his organic insect breeding operation in Endingen (AG) © Video: Vontobel 2018. Since spring 2017, Switzerland has allowed the sale and consumption of insects. The Federal Food Safety and Veterinary Office gave this the green light. However, in order for "Swiss made" insect burgers or pralinés to find their way onto Swiss plates, it is necessary to tap the most important source of raw materials, and the right crickets, mealworms or grasshoppers are not indigenous in this country. Their production still takes place almost exclusively abroad. That's what Benjamin Steiner, co-founder of the start-up company Ensectable, wants to change in the future. Insects are small, they need little space, hardly any food – and they multiply rapidly. In addition, their food chain does not affect the diet of us humans, in contrast to conventional livestock. From a sustainability standpoint, this makes them unrivaled in many ways: economically, socially and ecologically. So are insects the long-awaited opportunity for a society that has an appetite for both meat and sustainability? In principle yes, Steiner is convinced. But first a lot of pioneering work has to be done. "Insects don’t eat anything we want to." It will take time before feasting on insects is as commonplace as a meal of meat or sausage. Until that day, however, everyone faces challenges: the consumer, who has to overcome his culturally influenced squeamishness and comprehend that good food can also be good for the environment; the cook who needs to come up with creative ideas in order to give these new ingredients some zest; and the producer, who has to catch up on a lot of knowledge and experience until insect breeding in this country is at the same level as livestock farming, which is centuries old. Benjamin Steiner, together with economist Christian Bärtsch and animal keeper Mina Gloor, got the start-up going on his parents' converted farm, where it goes without saying that "organic" is very much part of the program. People who work with insects fear nothing as much as the insecticide residues that can be found on conservatively produced foods. That is why the young entrepreneurs from Endingen (AG) feed their insects exclusively with organic vegetable leftovers and waste as well as by-products generated in the production of organic beer and grain. 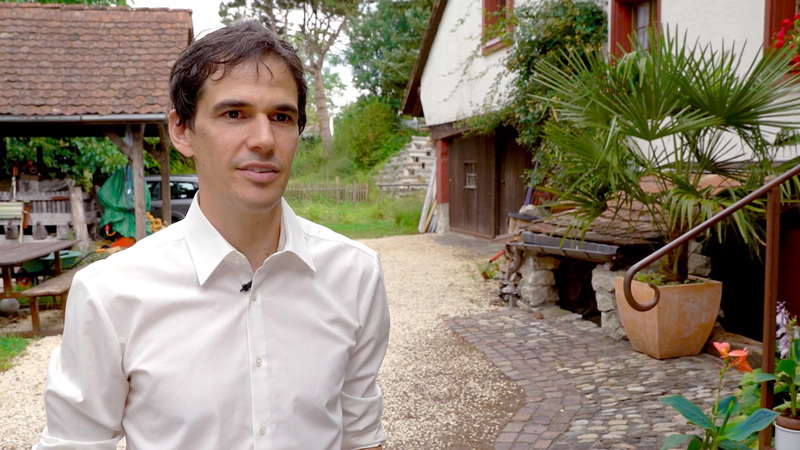 In our video interview, find out how this trained veterinarian is laying the foundation for Switzerland's first certified organic insect breeding operation. Benjamin Steiner is the founder and CEO of the Swiss start-up "Ensectable". He worked for several years as a veterinarian in the canton of Graubünden before he converted his parents' farm into the first certified organic insect breeding operation. Who are we? How do we live today? And will we still be able to live like this tomorrow? The issue of a sustainable future is preoccupying society more than ever, with engineers, doctors, politicians – each one of us, in fact – seeking answers. This interview with Dr. Benjamin Steiner is one of many contributions that shed light on sustainability from a new, inspiring perspective. We are publishing them here as part of our series "Impact". On Saturday, September 8, 2018, the start-up "Ensectable" inaugurated its certified organic mealworm and cricket breeding operation. Among other supporters, this pioneering project was made possible by contributions from the Swiss Climate Foundation. In the summer of 2008, Vontobel and ten Swiss companies in the services industries founded the Swiss Climate Foundation. The deciding factor was the introduction of the federal CO2 steering tax. As a result, large energy-efficient service companies such as Vontobel received more money back than the amount of tax they were required to pay. Indeed, climate protection works all the better if everyone is involved. Through the Swiss Climate Foundation, 27 partner companies are now donating their reimbursements to SMEs so that they can implement their own climate protection ideas.